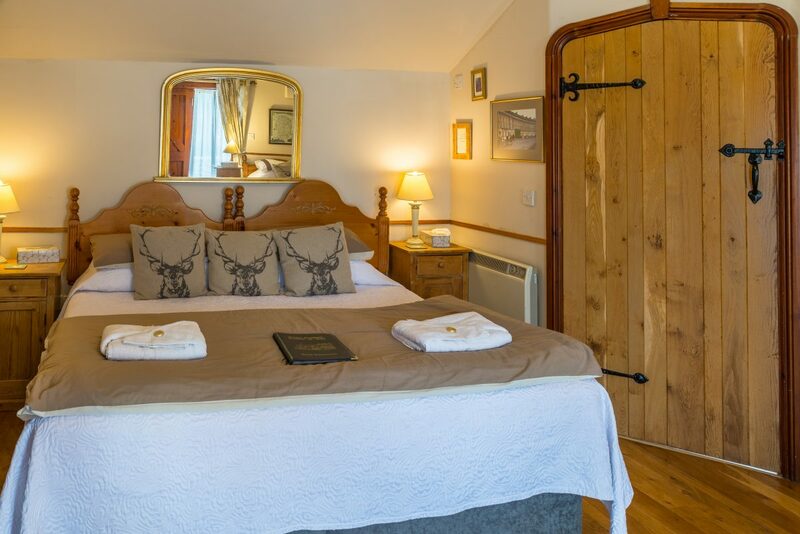 Pets: Well behaved and friendly dogs are welcome in four of our five rooms by prior arrangement. Ts & Cs apply. Onsite Parking: Yes. One car per room. 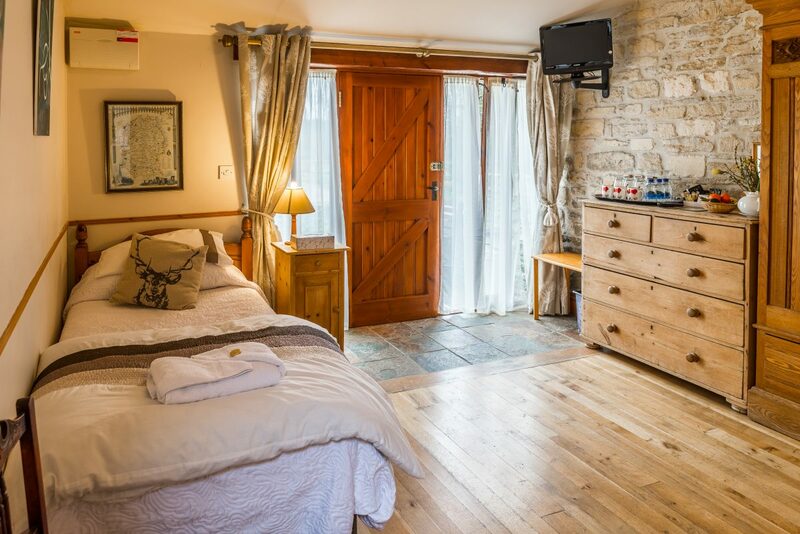 Farmyard accommodation in Bradford on Avon near Bath, has double / twin and family en-suite rooms and all, except one, in detached converted farm buildings, each having their own front door key and own patio area, giving you the independence to come and go as you please. 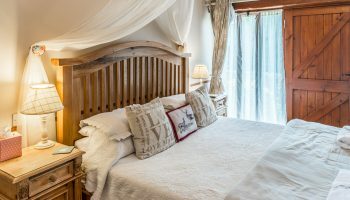 All rooms have full en-suite facilities including bath and/or shower and are decorated to a very high standard with exposed beams, stripped wooden floors and country pine furnishings. 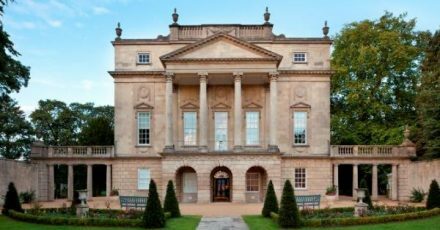 During busy periods there is usually a minimum stay of two nights at weekends unless ‘last minute’. 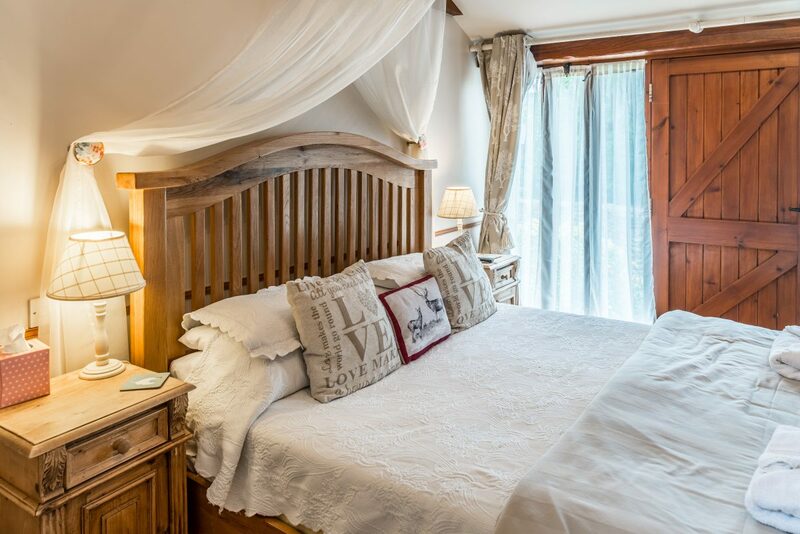 These rooms can be used with our self catering cottages for additional bedrooms. 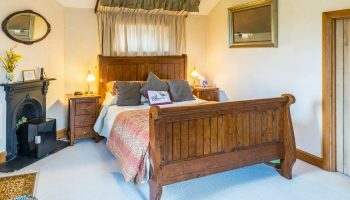 Guests Farmhouse Room sleeps two or three with an additional bed. Milking Shed can accommodate three or four with an additional bed. Potato Shed sleeps two. 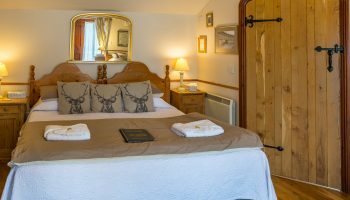 Old Dairy accommodates two or three with an additional bed. Cart House sleeps two or three with an additional bed. 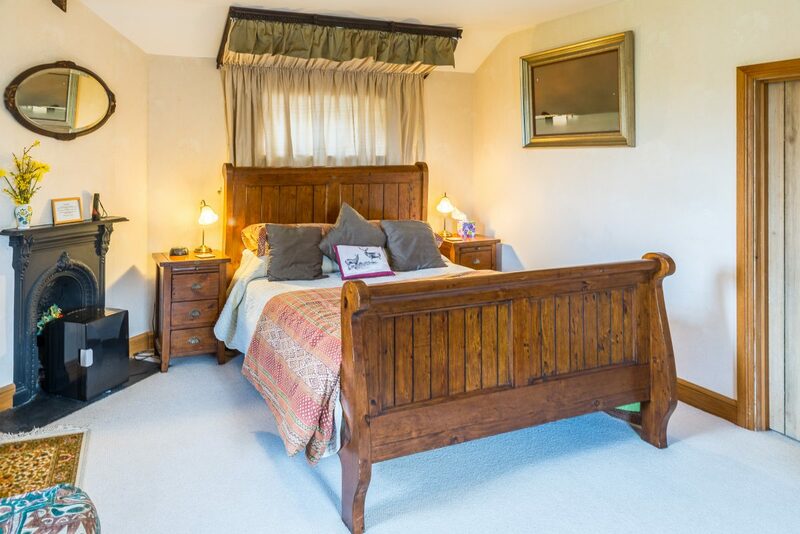 Bedrooms Farmhouse Room is situated upstairs in our farmhouse and is a large room over looking our gardens and fields to the rear. 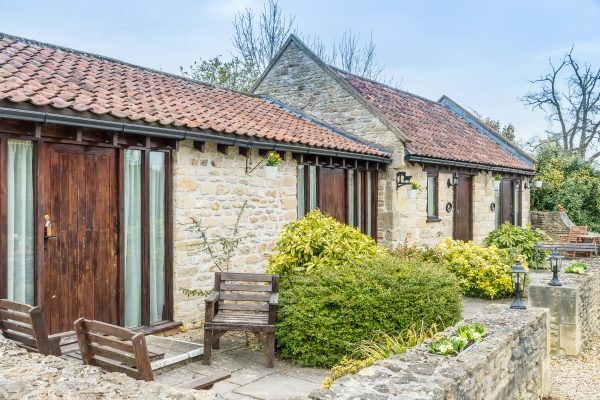 Milking Shed is a family/triple room in a converted farm building with a patio. 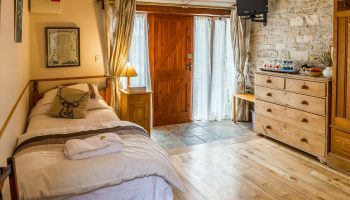 Potato Shed is a double room in the converted farm buildings with a patio. Old Dairy & Cart House are double or twin rooms and can interconnect if required so ideal for a family. Bathrooms Farmhouse Room has a claw foot bathtub with hand shower. Milking Shed has a shower over a bath. Potato Shed also has a shower over a bath. Old Dairy & Cart House both have a walk-in showers. All rooms have a loo and hand basin. Breakfast is served in our Victorian style conservatory overlooking a running stream and landscaped garden and onto our "very free range" ducks and hens where you can collect your eggs for breakfast (subject to availabilty). A relaxing start to your day! Breakfast is from 8.30am to 9.30am. Entertainment There is a games rooms, children's play area and games field for the young or young at heart. Outside We have Shetland ponies, English Setters, cats, ducks, hens, guinea fowl in the gardens and fields. Parking On-site parking. One car per room. Electric car charger for guests. Smoking All our rooms are non-smoking. Pets Well behaved and friendly dogs are most welcome in all our rooms except the Farmhouse Room. TS & Cs and charges apply and can be viewed on our website. There are grassed fields to the rear of the property where dogs can be let off. Prices shown are ‘from’ and are subject to change. 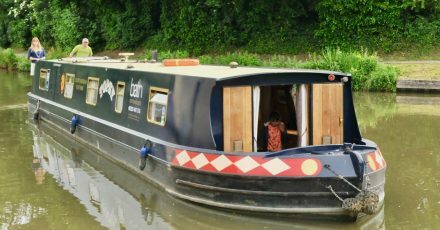 In the busier months we ask for a two night minimum stay at weekends unless it is ‘last minute’. Hosted check in is from 4pm until 7pm. Early arrival from 2pm can be pre-arranged if booked direct. Later arrivals are given directions to the rooms. This is not available for Farmhouse Room. 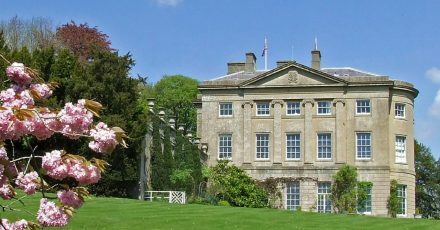 For those booking directly with us we offer a 30% on day tickets to Longleat and 25% for Cheddar Gorge & Caves.